Answered my own question, looks like they are open Mon-Fri, I'm off fridays so that will have to work. not_quite_indie wrote: Answered my own question, looks like they are open Mon-Fri, I'm off fridays so that will have to work. let me know what you plan is. I be gone in the morning until 1pm, then off to a winery about 3pm. 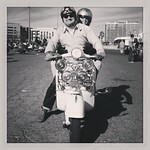 so a short window if you need me to ride/deliver your scoot to your place or DMV. riding it to JC may be a challenge since we've just been doing neighborhood stuff. since you're transferring titles, you might consider Springfield. Just completed a trek across town at rush hour.